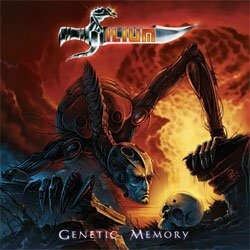 ILIUM - GENETIC MEMORY (CD) | Online Shop | Wizard LTD.
Ilium is a melodic power metal band from Newcastle, Australia with strong roots in the classic heavy metal sound as purveyed by the likes of Iron Maiden, Black Sabbath and Judas Priest. The band has already released four albums and is currently poised to release their fifth album 'Genetic Memory' on Escape Music. Guitarist Jason Hodges and original vocalist Mark Snedden formed the band as Iliad in 1998 having previously played together in Oracle in the early 1990s. This embryonic version of the band also included former Oracle guitarist Kris Arendse and the final Oracle bassist Michael Noonan, as well as drummer David Pearson. With the introduction of Adam Smith (also formerly of Oracle) on guitar, the band changed its name to Ilium, with Kris leaving the band after a brief stint with three guitarists. In 2002 the band commenced work on their eponymous debut EP produced by Lord Tim, but Michael Noonan played on only two tracks before leaving the band, with Adam Smith completing the bass duties and yet another former Oracle member Matthew Woodland joining the band shortly before it's release. The EP, which included a cover of the Fleetwood Mac/ Judas Priest classic 'The Green Manalishi (With The Two-Pronged Crown)', gained the attention of several notable labels, including Sentinel Steel boss Denis Gulbey, with Italian label Adrenaline's metal label Steelheart signing the band for the release of their debut. The band's third release 'Vespertilion' was released in Dec 2007 and again has been given very favourable reviews by Rock Hard! and other publications. This album was the last to feature vocalist Lord Tim, Ilium recorded their 4th album, entitled 'Ageless Decay' (ESM191) with vocalist Mike DiMeo, a legend in metal circles being the longest serving vocalist for New York legends Riot before succeeding Jorn Lande as the lead vocalist for Roland Grapow's post-Helloween project Masterplan. The album was mixed and mastered by the Danish power metal legend Tommy Hansen, who practically wrote the book on power metal production with the godfathers of the genre, Helloween. Ageless Decay was a breath of fresh air for the band, with Mike DiMeo fitting into the lead vocal slot in an effortless manner. The music is more dynamic than before and flows along with magnificent guitar leads and bold keyboards. This is Power metal like you have never heard before, totally professional and so infectious, the hooks will leave you spellbound from the start. It’s now 2011 and Ilium have recorded 11 brand new songs, which are so infectious they will have you hooked from the start. That powerful metal tone is still there with bags of melody to back it up. This time Swedish mixer extraordinaire Martin Kronlund is twiddling the knobs, making this fifth outing more special than ever…. Ilium is maturing fast into a formidable power metal band that will leave you drooling for more. This new CD is their finest hour.